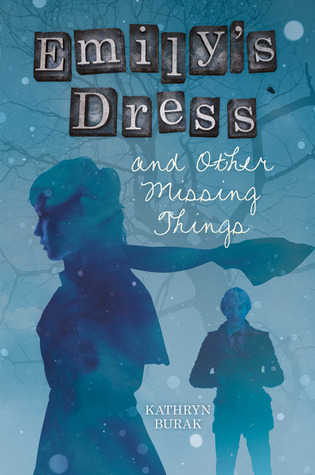 EMILY'S DRESS AND OTHER MISSING THINGS chronicles teenage Claire's attempts to come to grips with multiple losses. Having lost her mother to suicide years ago, Claire is now struggling with her best friend Richy's disappearance. She feels responsible for both losses and afraid to jinx anyone else she might befriend. Claire finds solace in the poetry of Emily Dickinson and, one night, one thing leads to another--and Claire accidentally steals the famous poet's dress from the Emily Dickinson House! With the help of Tate, her student teacher and friend, Claire must return the dress--and sort out all of the other missing parts of her life. Suicide, disappearance, loss, and grief--too much for a single novel? Somehow Emily's Dress and Other Missing Things balances all of these tough subjects without ever crossing into melodrama or after-school special territory. Even though college-bound Claire is YA age, the narrative handles issues with such poignant sensitivity that mature middle schoolers could read and enjoy the novel. Intelligent and sympathetic, Claire will appeal to many readers, especially young girls with ears for poetry. High stakes mysteries thread themselves throughout the novel and will make readers want to keep reading. The language in the novel is subtle, but lovely. I can see how the writing style may not appeal to everyone--especially those who balk at poetry. But Burak's quiet lyricism made this Emily Dickinson fan read long after that "certain slant of light" faded into dusk.